Calls involving kids are the hardest. The one that brought me to my knees involved the death of Zippy, a nine-year-old girl I knew, on Christmas Day in 2011. I’d been a firefighter and EMT for 11 years and had been to many accident scenes like hers. But this time, I put my head down on the chief’s car and cried. I cried for weeks after that. Sporadically. By myself, but also in public. My public tears at the scene led to a Critical Incident Stress Debriefing, the only tool my volunteer fire department employs to address the impact that public service has on our psyches. It’s the only CISD I’ve ever been invited to attend. My public tears in a coffee shop also led to the creation of Whidbey CareNet, a nonprofit through which providers offer free services such as counseling, massage, and chiropractic care to emergency responders. In 2000, I was a carpenter who spent my evenings at soccer games, cello recitals, swim meets, and school events with my wife and two sons. I was a member of the local wine club and an aspiring drummer, playing here and there with local musicians. As a safety committee member for my construction company, I had to learn CPR, which turned out to be useful when my son’s friend had an asthma attack and sank to the bottom of our local pool. We got him out and did CPR. The firefighter/EMT from whom I had learned CPR responded to that call and invited me to join the department. “You obviously have what it takes,” he said. After that, evenings also involved firefighter and EMT academy, drills, conferences, and events in which I educated the public in fire and medical safety. And of course, I responded to calls in Northfield, Minnesota, a city with a population of nearly 18,000. Little by little, I became more isolated. My marriage eroded. I became fearful about what could happen to my kids and kept myself busy to hold memories at bay. There were days when I didn’t want to be in my own skin. I felt like I was in a box that was too small in every direction, tried to control my world, so it didn’t overwhelm me, and got irritable when I couldn’t. It wasn’t until I’d been a firefighter/EMT for more than 14 years that I recognized those symptoms as PTSD. But I’m a helper, and helpers don’t ask for help. I’m the “hero,” the one who answers your call for help. The result is that, among firefighter/EMTs, deaths by suicide outnumber line-of-duty heart attacks two to one. And if helpers do muster the courage to ask for help, they put their careers at risk only to be told that there’s no cure for PTSD. But I’m here to tell you there is a cure. Shannon Pennington, founder of the North American Firefighter Veterans Network, encouraged me to try Tension and Trauma Releasing Exercises (TRE®) because it had helped him with his PTSD symptoms. I’m so glad I did! TRE has enabled me to release debilitating traumatic stress and has healed me. I see it healing others daily. 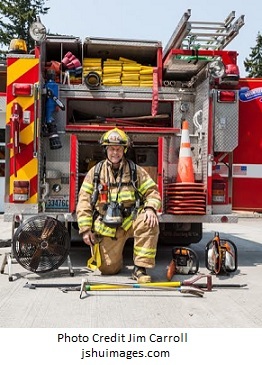 Leckey Harrison has served as a firefighter/EMT for 15 years and is a certified provider of TRE. For more information about Leckey and his work, see RaiseYourResilience.com.